This compact sports car from Toyota is a rugged car that is made to take on rough tracks with complete ease. This roomy and easy to handle car has a huge 251 litres of boot space that allows the riders to put a large number of suitcases, golf bags and other Knick Knacks so that you can plan long outings without worrying about carrying space for your family luggage. The boot lid is remote controlled and the cargo hold also has a light to see in the dark. The main rivals of the Toyota Etios Cross have much lesser boot space compared to the Toyota Etios Cross. The rivals Maruti Suzuki Swift, Honda Brio, Ford Figo and Volkswagen Polo have 205 litres, 175 litres, 284 litres and 280 litres of luggage space respectively. 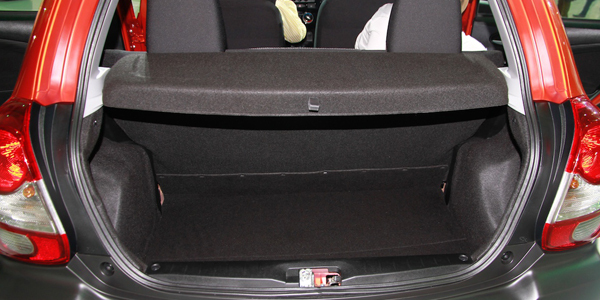 The boot space of Toyota Etios Cross compares with that of Maruti Suzuki Swift, Honda Brio, Ford Figo, Volkswagen Polo. The boot space of Toyota Etios Cross is 251 litres, whereas the boot space capacity of Maruti Suzuki Swift is 316 Litres. On the other hand, Toyota Etios Cross boot space competes to Honda Brio with 175 Litres of boot space, and Ford Figo having 284 Litres of boot. Generally, it's considered a great deal if the boot space capacity of a car is beyond 300 Litres, whereas, boot space below 300 litres isn't recommended if your primary goal of buying a car is boot space.